Ridgetop Group’s CPT1000 is a new, hand-held, fault isolation tool that reduces Mean-Time-to-Repair (MTTR) by 20% from pinpointing the specific electronic modules in an interconnected cluster that prove to be defective. Rapid maintenance and repair of electronic modules in the F/A-18 are crucial to mission success and current test methods do not support testing at the O-Level. Initially created at NAVAIR Lakehurst by Russell Shannon, PhD, this tool concept and prototype IP was licensed to Ridgetop Group, Inc. for further development and feature augmentation, including intermittency detection and cable FDR (Frequency Domain Reflectometry). 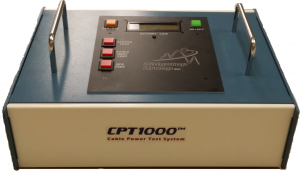 The CPT1000 unit is an innovative, rapidly deployable maintenance tool that provides failure detection and isolation solutions that reduce repair and life cycle costs of fleet Aircraft. Aged electronic subsystems, some still being used past program service life, face degradation due to harsh environmental impacts such as lightning strikes, extreme temperatures and other adverse conditions that have degraded modules to become “off nominal”. Unfortunately, current conventional test stands are unable to pinpoint the specific Weapons Replaceable Assemblies (WRA). The avionics bay of an aircraft will have an array of modules that must work together to be in operational condition. Sometimes the source of the fault can only isolated to several circuit boards in the bay. However with the CPT1000, higher resolution fault location is available. The CPT1000 is anticipated to reduce Mean-time-to-Repair (MTTR) of electronic sub-systems in the F/A-18 by 20%, saving costs, improving reliability and supporting operational readiness and “speed to the fleet”. The CPT1000 provides readiness for faster delivery to achieve mission success. The proven history behind our hand-held service tool is evidenced through its concept inception at NAVAIR – Lakehurst, where it was designed and tested to isolate faults in F/A-18 electronic subsystem modules. Power Fault Isolation Augments existing test methods to overcome fault ambiguity and provide specific location of faults. Uses power test analysis protocols. Intermittency Detection Often service personnel are plagued by intermittencies at the board or module level caused by interconnection connector problems or cracked solder joints. Ridgetop will embody its patented SJ BIST technology into the CPT1000. Identification of Cable Faults Using advanced Frequency Domain Reflectometry (FDR) methods, the CPT1000 can find faults within shielded cables, using a single-node Vector Network Analyzer (VNA) to use reflection as a means of detecting impedance mismatches caused by crimping, crushing an breaks in wires. First developed by Tektronix, Time Domain Reflectometry (TDR) has been proven over the years as a reliable tool for locating crimped or broken conductors within cables, but is deficient compared to FDR, which is less complicated to understand operationally and less expensive for long term sustainment activities..
Low Power and long life Disposable light weight battery provides ample power for the instrument. Low power allows instrument to perform its functions, and self-powers down if not being used. Hand-held configuration Allows instrument to be used on the flight line or anywhere in the hangar. Weight is approximately 1.5 pounds. This entry was posted in Prognostics on September 7, 2017 by Teresa Hardy.